AS A COMPACT CARD GAME! Welcome back to the beautiful island of the Republica de las Bananas! Nothing has changed here: players are members of a corrupt junta filling their pockets as quickly and efficiently as possible (thanks to the constant stream of foreign aid money coming in). Your methods are ruthless: players are plotting against each other, buying votes, hiring assassins, and blowing up buildings - and, from time to time, starting a coup against the president to hopefully become the new president. 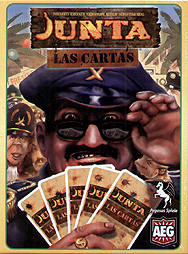 Junta: Las Cartas provides the full experience of its big brother Junta in a compact card game format. At the same time, it is the perfect entry point for newcomers to the Junta universe!